For small groups traveling short distances, we recommend a modern, reliable 18-passenger minibus. Transport event attendees to and from your venue, or take a ride to Florida’s top nightclubs for a birthday or bachelorette party. Either way, you’ll ride comfortably and safely with friends and family. Each bus comes with a knowledgeable driver who will handle all navigation and parking. We only work with experienced drivers who meet our high standards of customer service and professionalism, so you’re in good hands when you partner with Florida Charter Bus Company. Call our friendly reservation specialists today at 305-359-5975 for a personalized quote on your upcoming trip! We’re available 24/7 to help you book transportation for your Florida wedding, corporate conference, sporting event, and more. As our largest model, the 56 passenger MCI coach has access to a wide array of premium features such as WiFi, on-board restrooms, and luggage bays. 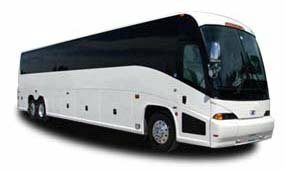 Whether you're traveling cross-country or across town, MCI coaches will get you there safely and in style. For smaller groups, the 20 passenger minibus has ample room and many of the same premium amenities as our full-sized models. This minibus model can comfortably suit groups of all sizes as they are transferred to events and group outings around the city with ease. Keep your trip intimate with a minibus. As one of the most compact, yet reliable vehicles the 18 passenger minibus is the number one choice for small groups who don't fit the sizing standards of a full-sized charter bus. Instead of splitting between public transportation and rideshare apps, you can get more for your dollar in our smallest model. Medium-sized groups enjoy traveling around town in a 25 passenger minibus for comfort and privacy. This minibus model is a great choice for groups too big for rideshare services, but too small for a full-sized charter bus. As the largest minibus, it's the ideal travel method for event shuttles, private tours, parties, and more.